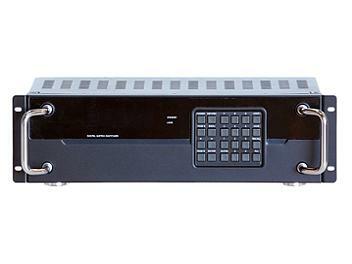 The SMR-650 can switch and distribute up to sixteen SDI sources to any sixteen SDI sinks, providing bandwidth up to 2.970 Gb/s for 3G-SDI video support. In addition, this matrix also features IP control allowing users to access and control the matrix remotely. Signal equalized and re-clocked to improve signal transmission distances. Supports signal input and output distances of up to 250m for SD-SDI signals, 200m for HD-SDI signals and 100m for 3G-SDI signals. Supports audio sampling rate at 48 kHz. Connects with other units to extend your signal over longer distances.